I remember first learning about the health benefits of drinking lemon water probably twenty-five years ago. At that time, I was told that drinking lemon water first thing in the morning was especially good for cleansing the liver. In my nutrition studies, I learned that lemons are a good source of citric acid, potassium, calcium, phosphorous and magnesium. I took these two events as a hint that I needed to know more about lemons. It was time to do a little more research. What I found is truly amazing. Drinking lemon water can diminish tooth enamel. You can find out how to prevent this on this page. If you have ulcers or a known citrus allergy, you should not drink lemon water. Pregnant women should only drink lemon water in moderation and should consult a doctor first. Sorry, but this forum is currently closed for questions. You can use our Google site search box below and type in a few key words regarding your question. Review the results and see if you find your answer. How much weight can I lose and how fast? I am drinking the lemon juice early in the morning before food ! I have lots of limes on my tree. Will they do? Response: You can compare the benefits of lemons and limes here. Drinking lemon water with ulcers? 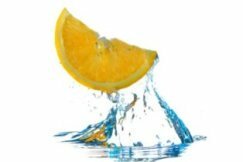 Lemon in water during pregnancy to reduce weight? Will lemon water interfere with my medications? Demerits of Drinking Lemon Water?